Where Is Blockchain Going in 2017? Recently, an advocacy group formed to increase global awareness of the benefits of blockchain technology. The goal of the Global Blockchain Business Council (GBBC) will be to demonstrate to businesses and technology innovators the many benefits of using the technology. One of the biggest obstacles GBBC must overcome is the fact that many professionals still don’t fully understand blockchain technology. In order to convince those very professionals to consider using it, it’s important to first help them fully understand what it is. Blockchain technology is often closely associated with bitcoin, but the blockchain goes well beyond digital currency. Bitcoin relies on the blockchain ledger, which tracks each transaction in a neutral, publicly-available format. But, this technology translates to many other financial areas, as well. In the coming years, technology professionals will likely find a wide variety of ways to implement it into business applications. 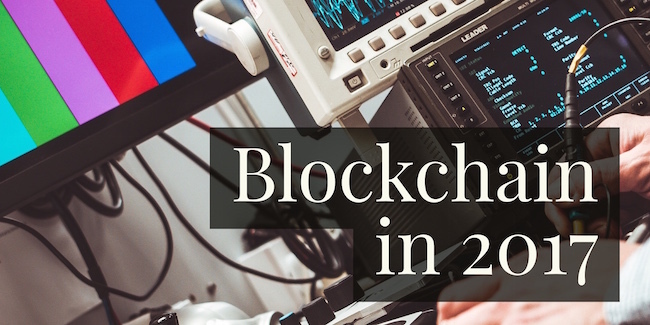 In 2017, both business and consumer markets will move closer to widespread adoption of blockchain technology. Here are a few things to expect in the coming year. Bitcoin creators took financial institutions out of the equation, allowing consumers to transfer money directly to each other using a digital form of currency. Without an intermediary, there was an immediate demand to track each transaction that took place. This publicly-distributed ledger is called a blockchain, which was created in the 1990s as a cryptographically secured chain of blocks. While creating bitcoin, the inventor used this technology to develop a ledger to serve as the public tracking mechanism. It would not only help keep bitcoin more secure, but it would eliminate the need for an administrator, since transactions would be recorded as each transaction took place. In 2017, consumers will hear more about how businesses are putting this security technology to use, which will in turn show how the blockchain will apply to them. Once separated from its connection to bitcoin, the blockchain becomes a way to track information more securely and accurately. Blockchain can be easily implemented in government applications, as well as those that back business and finance. The blockchain’s timestamps can be shown and proven to professionals as a way to solve many of the issues they face each day. Once a technologist explains how the blockchain can be applied to a specific business, professionals are more likely to grasp the concepts behind it rather than thinking of it on a much broader level. The internet is an unending content repository, often making it difficult to detect when copyright infringement has taken place. The technology behind the blockchain could be used to detect duplicate content in various forms and alert the original poster of the violation. While there are sites that allow content creators to detect instances of plagiarism, someone must manually check every post individually to find duplicate content online. The blockchain can run in the background, automatically tracking when something is a duplication and taking appropriate action based on that information. The technology is also used to power matching services like dating sites and guest posting databases. The blockchain tracks interactions, giving a site’s software the information it needs to alert customers of their past communication history with a specific source. In general, blockchain technology is improving the database operations across all industries, since it allows computers to apply changes to multiple computers at once without a central actor. This success and security will cut down on costly errors, making it an attractive addition to any business’s technology. Perhaps the earliest adopters of blockchain technology is the financial institutions. Late last year, IBM predicted that 15 percent of big banks would use the blockchain by 2017. Banks are increasingly trying to find ways to allow customers to transfer funds quickly. As long as each transaction goes through an intermediary, the process will always be slower than transferring funds via the blockchain or via Bitcoin. In addition to consumer lending and retail payments, banks are also eyeing blockchain for use in reference data, which is the method banks use to share information from one institution to another. By putting the right technology in place, banks are making a transaction that would traditionally have taken several days, will now take place instantaneously. Even the small percentage of banks putting blockchain technology in place, are likely to set off a chain of events that will have those numbers increasing in the years that follow. Once the rest of the large banks begin advertising real-time fund transfers to customers, other banks will want more information on how they can provide this same level of service. Over time, those banks that have sped up funds transfers will likely win customers away from smaller banks that have declined to learn more about this updated technology. Experts predict a future in which the blockchain continues to help more consumers manage their own online identities. Currently, businesses collect and store a large amount of data on individuals, including their history of interactions with their websites. The blockchain removes intermediaries, letting individuals create an avatar that puts them in control of the information they share with each site. Customers have long needed the ability to select only the information that is absolutely necessary to access the services they need and share only that small amount of information, instead of allowing the site to decide what it needs (and wants) to collect. Eventually, these avatars will be set up to allow consumers to give up information in exchange for rewards. An airline could offer rewards points in exchange for data from a person’s social profile or wearable device. This gives customers the choice to share that information for a discount or freebie, rather than simply requiring that they link all personal information in order to qualify for membership. In 2017, the Internet of Things (IoT) will continue its move into the business environment, helping companies operate more efficiently. Using an existing system for building decentralized applications from blockchains, technologists can set up applications with predefined triggers that cause certain coded actions to deploy on command. One system already offering this functionality is Ethereum, a platform that uses contracts to launch programmed activities using the blockchain as its foundation. This eliminates the need for developers to rely on third parties to accomplish their goals, making applications safer and less costly. Experts are also eyeing the blockchain as a way to boost security in the IoT. Most importantly, the IoT will cause the number of internet-connected devices to quickly multiply, leading to a demand for some centralized resource that will track and log activities each day. The blockchain could be the answer to an already-emerging question of how to keep devices secure and stable in an overcrowded tech environment. With the blockchain acting as an intermediary, the IoT will be able to operate more efficiently as devices communicate with each other. Since the blockchain is tamper-proof, customers will see a reduced risk of their personal data being leaked via a security breach. If IoT device manufacturers aren’t currently utilizing the blockchain, over time they’ll see the benefits and put this technology in place. With each new year, the blockchain’s many benefits become clearer to those who take time to learn about the technology. More professionals than ever before are implementing the secure ledgers into their own applications, and competitors naturally want to learn more, which is leading the adoption of blockchain to naturally grow at increasing speeds. Next PostBusiness Owners: How Much Should You Pay Yourself?